It is Thursday and the end of the trading week is here soon. I hope everyone is green with profit! If you are not, do not trade with emotions. Plan your trades well and do not rush into trades. Yesterday we noted the EUR/USD testing a previous trend line which is functioning as a resistance. Both the US and Euro Zone economies remain fragile and uncertain. Looking at the EUR/USD chart above, we observe a testing of the line of 1.368. I LOVE IT WHEN MY CHART WORKS! The S&P 500 remains around the 1140+ region. This suggests mixed sentiments in the market. Oil approaches the $80 mark. If it clears beyond this line and holds the fort, we may be moving into a new phase of the economic recovery. Oil can sometimes shed clues on the global economic health. Gold remains elevated at $1300+. Economic data on both sides of the Atlantic today is mainly good. German unemployment dropped and US unemployment claims dropped too. A word of caution though as we observe that these positive data are in no way any indication of future optimism. Sometimes sentiments just take a nose dive leaving investors caught with their positions. The equities, oil and gold are showing mixed signals too. A report was commenting on the accelerating rate of foreclosure in the US. These add to the pool of available property, further dampening the housing market. We must always remember that with such economic anchors around, the recovery will remain slow. Besides a speech by Fed Chairman Bernanke later on, tomorrow brings us important economic data such as the German Retail Sales and US ISM Manufacturing PMI. The weekend is coming soon! Have you made your plans? The EURUSD had a moderate bullish momentum yesterday, topped at 1.3645 and closed at 1.3624. Overall we are still in strong bullish phase targeting 1.3700 – 1.3800 area this week especially if price make another breakout above 1.3645. As you can see on h4 chart below, CCI about to cross the 100 level indicates potential minor bearish correction testing 1.3550 – 1.3500 support area. In the last two weeks price bullish movement is characterized by breakout – consolidation – breakout patterns. So right now, with CCI start to show potential downside pullback re-testing zero level, we may be in another consolidation phase but short position is not recommended. Only a movement below 1.3500 and violation to the bullish channel could diminish the bullish outlook and trigger further bearish correction. The EURJPY didn’t make significant move yesterday. The bias is neutral in nearest term but still in a major strong bullish outlook as long as price keep moving inside the bullish channel targeting 114.73. CCI just cross the 100 line as you can see on my h4 chart below indicates potential downside correction testing 113.35 and the lower line of the bullish channel. A violation to the bullish channel could be a serious threat to the current strong bullish outlook testing 112.67 region. The GBPJPY made another volatile but indecisive movement yesterday. 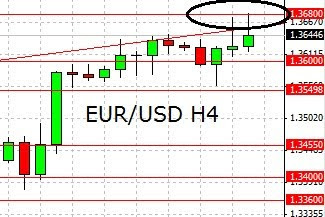 On h4 chart below we can see price still trapped between 23.6% – 50% Fibo retracement. The major scenario remains bullish re-testing 135.03 but the bias remains neutral in nearest term and we need a break from range area to see clearer direction. Aggressive traders may long around 131.70 (50% level ) or short around 133.55 (23.6% level) with tight stop loss. The AUDUSD bullish momentum was paused yesterday. The bias is neutral in nearest term but still in major strong bullish scenario targeting 0.9792 and 0.9849 especially if price able to make a strong breakout above 0.9728 today. CCI in neutral area on h4 chart indicates limited bullish momentum with potential bearish correction testing 0.9600 but I still prefer a bullish scenario at this phase. The GBPUSD made another volatile but indecisive movement yesterday. The bias remains neutral in nearest term. We are still in strong bullish phase and I still prefer a bullish scenario but need a clear break above 1.5900 to continue the bullish scenario testing 1.6000. On the downside, key support level remains around 1.5728 and the lower line of the minor bullish channel (red). Break below that area could diminish the bullish outlook testing the lower line of the major bullish channel (white). The USDJPY didn’t make significant movement yesterday but still able to stay below 84.00 and made a lower low on daily chart indicates the rounding top bearish scenario remains intact targeting 82.87. Another pullback above 84.00 could lead us to neutral zone as direction would become unclear but only a break above 84.82 could cancel the rounding top bearish scenario. Fundamental focus still about the potential intervention by the Japanese government to stop further Yen appreciation. 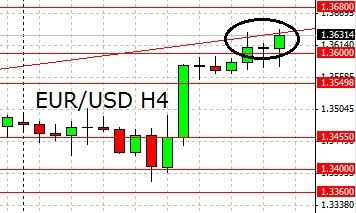 The USDCHF was indecisive yesterday, formed a Doji on daily chart. The bias is neutral in nearest term but still in the context of major strong bearish scenario targeting 0.9647 especially if break below 0.9730. I have made adjustment to the bearish channel. Immediate resistance at 0.9814 (yesterday’s high) and the upper line of the bearish channel. Break above that area could trigger further upside correction but as long as price stay below 0.9931 I think we are still in strong bearish phase. Many have happened during the past weeks. Within a month, the EUR/USD climbed almost 1000 pips. The bullish momentum is strong. Many koalas told me that they were looking for a top and got their positions wiped. Once again i will like to remind everyone. For the sake of your money, do not try to pick tops and bottoms! Forex is never 100% predictable. After a test of the 1.34 region, the EUR/USD had a jump right up to the 1.36 region. It seems to be facing resistance along a trend line i plotted from previous price action. The S&P 500 is now at 1140+. Sentiments seem to be mixed as equities display a similar pattern. Oil is approaching $80. This may be due to a weakening US Dollar as oil is priced in US Dollars. Gold remains elevated and it may suggest that a storm is brewing as investors tend to invest in gold during times of uncertainty. The economies of the US and Euro Zone remain fragile. As much as we want to believe that the recovery is strong and robust, the economic data tells a different story. The US debt deficit is increasing and the Euro Zone remains threatened by the budget deficit crisis. The market is quick to bash the weaker economy and hence one must be careful of sudden shift in sentiments. FOMC Member Rosengren is due to speak soon and hence do be careful about unexpected spikes. Tomorrow brings us more economic data such as the US unemployment claims and a testimonial from Mr Bernanke. My sincere apologies for missing out on a review yesterday. While my commitment remains, my crazy work is simply draining my time and energy. Flu is my best friend now and sleep is a rare commodity for me. What should i do? ARRGGHH. In my weekly summary on Saturday, I said that the EURUSD bullish momentum indicated and started by strong consecutive breakouts and we could see more breakouts. As you can see on my h4 chart below, yesterday we have another strong breakout with big bullish candle above 1.3500 after price bounced from the lower line of the bullish channel which provided good support. CCI also rejected to move below zero level indicates bullish momentum remains strong. This fact could continue the bullish momentum targeting 1.3700 in nearest term before testing 1.3800 – 1.3888 area. Immediate support at 1.3500. Break below that area could lead us to neutral zone in nearest term re-testing the lower line of the bullish channel but the major scenario remains strongly bullish.